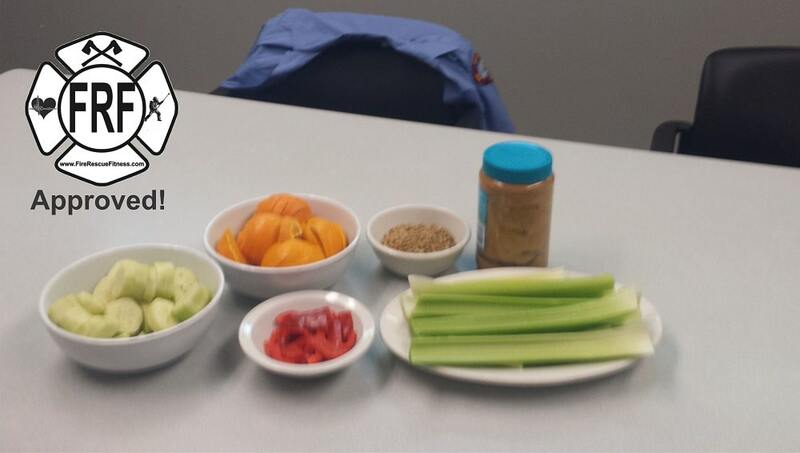 Do you want to know how fit fire rescue athletes make nutritious meal choices? Here are some shortcuts, go-to recipes, cooking suggestions and go-to snacks for making the life of a fire rescue athlete a little healthier. Eating healthy with a demanding job can be difficult. Add in the fact that the firehouse is usually full of non-nutritious choices like cakes and baked goods and its no wonder that obesity, diabetes and heart disease are huge concerns in the fire industry. Yet, as any busy person, or appointed firehouse cook can attest, whipping up a healthy nutritious snack or meal at the end of a long shift can be time consuming and stressful. In fact, research by the American Sociological Association found that cooking can make many people stressed, anxious and unhappy. However, cooking and eating around the firehouse doesn’t need to be so stressful. Producing healthy meals and making the firehouse a more nutritious place is a possibility. Here are five (or six) ways that you can cook and eat more healthy in the firehouse (or any house). Click the video and read below. Out of sight, out of mind. Look around any firehouse kitchen. What do you see? If you said baked goods, breads and cookies, chances are you are overweight. Junk food on the kitchen counter is likely to lead to weight gain, a study in Health Education & Behavior found. Among men who kept baked goods visible in their kitchen, 39% were obese while just 6% were at their ideal weights (A bowl of fruit or vegetables was more typical for the slim guys). When you are hungry, you grab anything that is quick (and within reach). So, keep healthy options readily available at the firehouse and place the baked goods in the cupboards (or trash). Around our firehouse, I always try to have some celery and orange slices readily available. Keep frozen. Most of the healthy foods found in grocery stores can be found on the perimeter. But, don’t forget about the frozen section. You want to steer clear of those TV Dinners and sodium laden boxed foods but can stock up on frozen fruits ad veggies. Since they’re picked and frozen at peak freshness, their nutrients are comparable to those in fresh produce. In a pinch? Just toss some frozen greens and shrimp in a stir-fry and you’ve got a dinner for the crew in minutes. Winner, Winner, Easy Chicken Dinner. Pick up a rotisserie chicken a the store as a quick, ready-to-eat source of protein. Slice and serve with greens or use it as the base for a healthy pasta dish. 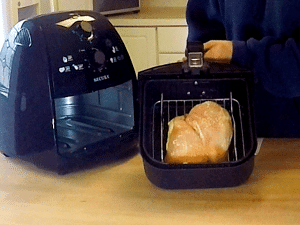 Or, use a healthy air fryer (click here for more information) The air fryer is perfect for frying, baking, grilling and roasting with little to no oil. The Air Fryer saves time in the kitchen. Air fryers are an efficient way to cook because they can heat from room temperature to over 300 degrees in less than three minutes, cutting cooking time dramatically. Three for 30. There is a simple formula for 30-minutes or less dinners: Choose a quick cooking protein (fish, chicken, or lean beef), a quick cooking whole grain (whole-wheat couscous, brown rice or quinoa) and a pre-washed green (arugula, spinach or snow peas). You can have a super-tasty dinner on the table in as little as 10 minutes if you learn how to simply prepare these three things. Stockpile healthy snacks. Get rid of the candy stash, its too tempting when you are hungry (especially after a call). Keep healthy snacks on you or the truck at all times—but some in your bag, have them on the kitchen counter, put some in the front of the fridge. Some convenient go-tos include nuts, homemade trail mix, fruit and nut bars, apples, bananas, clementines, single-serve nut butters, dried edamame and air-popped popcorn. If you have refrigeration, stock up on Greek yogurt, cottage cheese and hard-boiled eggs for protein-packed snacks. You can click here for the 10 Best Snacks for Firefighters. Bonus Hack- Drink more Water. Want to eat less around the firehouse? Drink more water. Have a water bottle on the engine or truck and carry another one around the firehouse. A lack of water can send the message that you are thirsty and on the verge of dehydration. Dehydration can manifest as a mild hunger, so, the more hydrated, the less “hunger” cravings. Whether you cooking or just eating in the firehouse (or any house), these hacks can help. Prepare to eat healthy and you will eat healthy. Give these “hacks” a try, feel free to comment and add your own. Rabbitt, M. “25 Healthy Food Hacks the Pros Use. Idea Food and Nutrition Tips. Nov-Dec 2015. Love the information, just found this. I’m working to lose some weight, but eating right. Awesome Mark, glad you like the info. Let me know if you have any questions or if I can help you in any way. Hello Frederic, thanks for reaching out. I have another post that might really help you out. Its 10 snack options for firefighters. Here is a link, I think this can help you. Let me know if you have other questions.